Ohio quarterback Derrius Vick calls a play for the offense. Ohio opened the season with a 17-14 victory at Kent State on Saturday night. Photo by Zak Kolesar. With the Kent State Golden Flashes driving after the Ohio Bobcats fourth faux pas – known Saturday as a fumble – quarterback Derrius Vick paced back and forth on the sideline. Vick, a redshirt junior, had the hot hand all game and longed to have the ball in his hand one final time. Vick had that chance with 3:34 left in the game, and running back A.J. Ouellette and kicker Josiah Yazdani helped him seize the moment. The offense cruised 48 yards down the field in just over three-and-a-half minutes, and the extremely accurate Yazdani finished the job with a 45-yard game-winning kick. 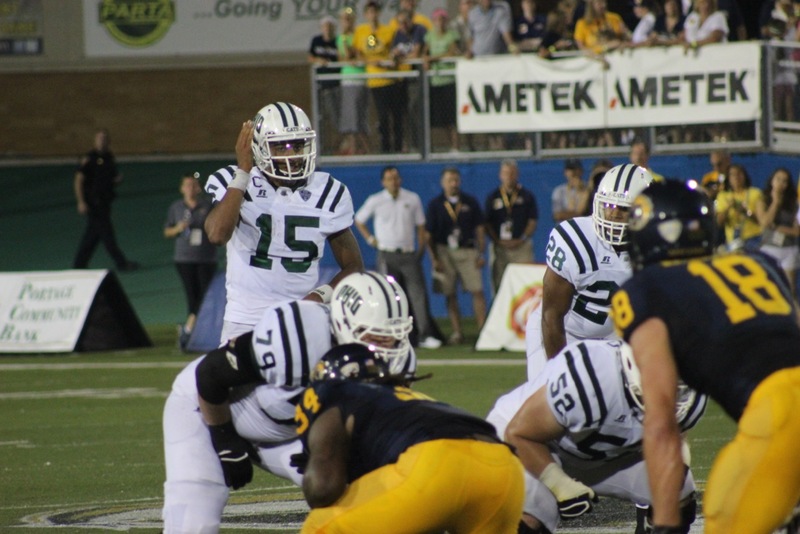 The new-era Bobcats started off the season in remarkable fashion, besting Kent State, 17-14. Vick shooed doubters away on Ohio’s second drive by displaying the poise of a true veteran, airing out pin-point passes for gains of 58 and 23 yards; the second one being a perfect read to Landon Smith down the middle to put the Bobcats up 7-0 early. “You’re not a regular person if you aren’t nervous before a game, but that all clears after the first possession,” Vick said. But Kent State (0-1,0-1 MAC) responded swiftly. The Golden Flashes marched 87 yards down the field, scoring on an eight-yard screen pass from quarterback Colin Reardon to wide receiver Josh Boyle to tie the game at a touchdown apiece. Following four punts between the two teams and a penalty that extended an Ohio drive, Vick got to work, hitting running back Daz’mond Patterson on a wheel route for a 38-yard gain. Following that play he hit Smith once again for a five-yard score. That strike put the Bobcats up 14-7 with less than seven minutes remaining in the first half. The ‘Cats (1-0, 1-0 MAC) were then able to cruise into the second half with a touchdown lead behind a stout first-half defensive performance. Ohio’s unit held Kent State to only 118 yards through the first two quarters and minus four yards on the ground; a testament to the experienced Ohio defense. The Bobcats started to get sloppy in the second half, however. On four straight drives – two in the third quarter and two in the fourth – the Bobcat running backs coughed up the ball, the final time being the most costly. Driving at the Kent 26-yard line with 7:39 remaining, Dorian Brown put the ball on the ground, and Reardon and the Golden Flashes started their march toward tying the game. Seventy-eight yards and four minutes later, Kent did just that. The game was knotted at 14, and now it was Vick’s turn to respond. Starting off the drive with a 13-yard completion to Smith, who finished with seven catches for 71 yards and two touchdowns, the Bobcats were on their way to victory. Ouellette and Vick combined for 35 yards on the ground following the completion, and Yazdani made his way onto the field. Two Kent timeouts later Yazdani was money, delivering the ‘Cats a victory to start off the 2014 season. The Bobcats will be on the road once again next week with a matchup against the Kentucky Wildcats (1-0). Kickoff is set for 3:30 p.m. on Sept. 6.